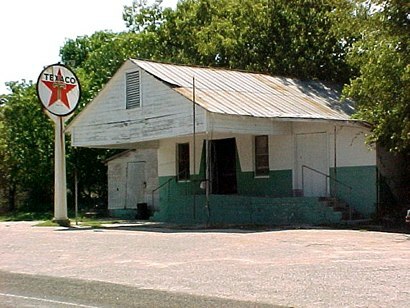 The "old gas station pulling duty as a post office." Higgins Gap, named after a family of early settlers, was Izoro's original name. In 1886 when a post office was applied for, they submitted the name of a local woman, Izoro Gilliam. Our source* says she "undoubtably was an extraordinary person" but it's also possible that the postmaster was smitten. Guns in Church: Local folklore tells of a romantic tragedy which occurred in the early 1900s. Two young people met and decided to marry despite their families' objections. One Sunday morning, things came to an ugly head with both the girl's father and would-be husband dead from gunplay. Several other family members of both sides were wounded.